The deluge of apps for the iPad has begun, and among the number that will be appearing in the App Store on day one is Memeo Connect Reader, a program that lets you access your Google Docs account and view the files you’ve stored there. 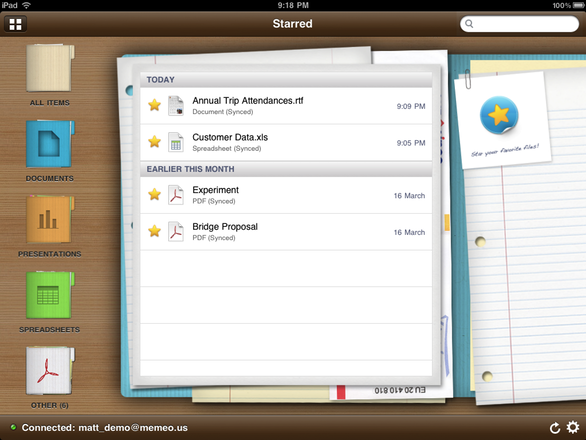 The Memeo team gave Macworld a sneak peek at the application (a demo video is embedded below). Memeo Connect Reader syncs with your Google Docs account to provide you with the most up-to-date version of all of your documents. When you launch the app and log in to your account, you'll be presented with a colorful set of folders that let you skim through your files by type (spreadsheets, presentations, documents, etc.). You can also navigate through the folders you’ve set up in Google Docs or view just the items you’ve starred—plus, if you star a document in Memeo Connect Reader, it will sync back to Google Docs and that status will be reflected in the Web interface. Memeo’s also added built-in search that lets you find documents by name, and—because even in this ever-connected world you might run into situations where your iPad doesn’t have Internet access—Memeo Connect Reader will cache your most recent documents for offline viewing. Memeo Connect Reader is specifically targeted at reading your documents; you can’t edit them, though the company says it is looking into adding an annotation feature in the future. But you can view any file that’s stored in your Google Docs account, whether it be the service’s own file formats for word processing, spreadsheets, and presentations or other files that you’ve uploaded, such as PDF, audio, video, and image files (the last three in formats that the iPad supports). Memeo Connect Reader can also display Microsoft Word, Excel, and PowerPoint documents and Apple’s Keynote, Numbers, and Pages files. The iPad app isn't Memeo’s first foray into the Google Docs game. In January, the company worked with Google to release MemeoConnect for Google Docs, a cross-platform application that allows users to easily upload and sync files of all types to Google Docs. As you might expect, MemeoConnect for Google Docs and Memeo Connect Reader for the iPad play well together: any changes you make in one will be reflected in the other, as well as in the Google Docs Web interface. All you need to run Memeo Connect Reader—aside from your very own iPad, naturally—is a Google Docs account. Memeo says any account type will work, whether it be a Premier Edition, Education Edition, or even just a standard Google Docs account. Memeo Connect Reader will be a free download for the iPad, and it will be available in the App Store on April 3.